The card offers 4x Membership Rewards® points on the two select categories where your business spent the most each month. (4X points apply to the first $150,000 in combined purchases from these 2 categories each calendar year.) You also pick up 25% points back after you use points for all or part of an eligible flight booked with Amex Travel, up to 250,000 points back per calendar year. Furthermore, new cardholders can earn 35,000 bonus Membership Rewards® points after spending $5,000 in the first three months of card membership. You can redeem points with 500 brands in travel, merchandise and entertainment, dinners to take out new or existing clients, and gift cards to reward your employees. While the $295 annual fee is higher than some business credit cards, for all you get in return, it could turn out to be well worth it. Terms apply; See Rates and Fees. American Express® Business Gold Card offers a "No Pre-Set Spending Limit" situation. This doesn't mean you have unlimited spending on the card, but rather, it adjusts your limit depending on your payment history, credit record and financial resources. And, since this is a charge card, you won't be tempted to let balances roll over and accumulate interest. This card has high spending caps in each of the bonus categories, so businesses with higher spending needs can enjoy more rewards from the outset. Membership Rewards® points are highly valued in the rewards credit card world and can be redeemed for everything from travel to gift cards to dinners out and more. Earn 35,000 Membership Rewards® points after you spend $5,000 in the first three months. While not sky-high, the annual fee only makes sense if your business spends enough annually to more than offset it with the rewards you earn. The card is great for business-related purchases, especially for travel, such as airline costs and gas, as well as shipping. American Express® Business Gold Card is geared toward businesses that routinely make big purchases - the four times Membership Rewards® points on the two select categories where your business spent the most each month is for the first $150k in combined purchases from these two categories each calendar year, so you can amass some serious points if you max out your spending in each of those categories. Furthermore, you'll need to be able to spend $5,000 in the first three months in order to earn that welcome bonus of 35,000 points. Other perks include no foreign transaction fees, which can stretch your international dollar and, perhaps best of all, no interest charges since this is a charge card as opposed to a credit card. You'll be paying off the balance each billing cycle, which does take planning, but should be a wonderful incentive to stay within your budget. The annual fee of $295 is hefty, so make sure your business spends enough in the various categories to rack up the rewards that will offset that fee. Additionally, it's a charge card so you have to pay off the balance each month. If yours is a business that anticipates needing to carry a balance from time to time, you'll want to keep that in mind before applying. The Capital One® Spark® Cash for Business card's cash-back program isn't as generous as that of the American Express card, but it also doesn't have limitations. You get unlimited 2 percent cash back on all your purchases, so you get the same amount no matter what you buy or how much of it. The Capital One® Spark® Cash for Business card's $95 annual fee is obviously more affordable than the American Express® Business Gold Card's $295 fee. The fee becomes irrelevant, of course, if you more than offset it with your rewards. Capital One gives a one-time $500 cash bonus once you spend $4,500 within three months of account opening, so the intro bonus is substantial. Lastly, neither card charges foreign transaction fees. The Capital One® Spark® Cash for Business is a regular credit card so you don't have to pay off the balance each month like the American Express charge card. This decision really comes down to where you spend your money and which card will better reward you based on that spending. 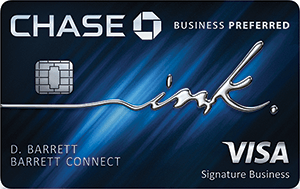 The Ink Business Preferred℠ Credit Card offers 80,000 bonus points after you spend $5,000 in the first three months, a substantial bonus. Plus, those are Chase Ultimate Rewards® points - highly valued and easily transferable to a wide range of loyalty programs. On the Chase card, you earn three points per $1 on the first $150,000 in select categories each account anniversary year, including travel, shipping, Internet, cable and phone services and advertising charges made through social media sites and search engines. You also get one point per $1 on all other purchases with no limit. The Chase card has a $95 annual fee (the first year fee is NOT waived), and, like the American Express card, the Chase card does not have foreign transaction fees. 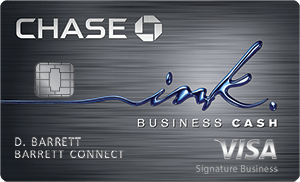 Once again, the Ink Business Preferred℠ Credit Card is a credit card so you don't have to pay off the balance each month. This relatively new business card also offers the rare perk of cellular telephone coverage for the primary line on the account as well as any employee phones on the same account as long as the bill is paid with your Ink Business Preferred℠ Credit Card each month. The first thing the stands out about the Bank of America® Business Advantage Cash Rewards Mastercard® credit card is that there is no annual fee. The introductory offer isn't as generous as the American Express card, but you don't have to spend much to take advantage of the offer with the Bank of America card. The Bank of America® Business Advantage Cash Rewards Mastercard® credit card offers a $300 statement credit after spending $3,000 in purchases within 90 days of the account opening. The Bank of America card offers 3% at gas stations (default), office supply stores, on travel, TV/telecom and wireless, computer services or business consulting; 2% cash back on dining (for the first $50,000 in combined choice category/dining purchases each calendar year 1% thereafter); and 1% cash back on all other purchases. You can redeem your cash rewards for statement credit or apply them to a Bank of America savings or checking account. This probably isn't the best option for businesses that engage in foreign travel as there is a 3 percent foreign transaction fee on all your purchases on the card while abroad. American Express® Business Gold Card is perfect for people who don't mind paying a high annual fee with the understanding that you get benefits with the card that make the fee worthwhile. The 4x Membership Rewards® points on the two select categories where your business spends the most each month (4X points apply to the first $150,000 in combined purchases from these 2 categories each calendar year) program is generous, and getting 25% points back after you use points for all or part of an eligible flight booked with Amex Travel, up to 250,000 points back per calendar year is really nice. There are no foreign transaction fees so the American Express card is a great option for small businesses that spend internationally. One important thing to remember is that the American Express card is a charge card so you have to pay off your balance each month. If this may cause a problem, you should check out other business cards. But if you don't want to pay finance charges and expect to pay off your balance each month, American Express® Business Gold Card could be the right card for you. To see the rates and fees for the American Express® Business Gold Card, please visit the following link: See Rates and Fees. The balance on this card must be paid off monthly but is also a rewards card and therefore perfect for the business owner who wants to earn rewards but doesn't carry a balance.